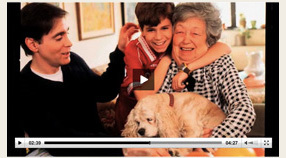 “KATIE THE WONDER DOG”–Makes Its Debut On YouTube Today! Ever had a long conversation with your dog? Better than any therapist, and often more sympathetic than a mate, Katie, the star of my upcoming book, was always ready to listen, her huge brown eyes flecked with gold, focused and alert. 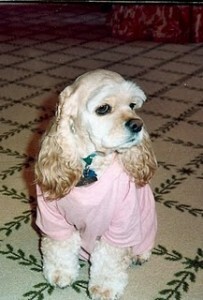 Over a period of fifteen years, I confided pretty much all my feelings to her, all the ups and downs of life. “Now, listen up, child,” I told her when she was young. “You’re a good little dog, you are, but you have to learn your manners. No biting, no scratching your nails on the furniture, no getting up on the white couch, and no accidents. And if you’re good, you’ll get a cookie or a nice piece of chicken.” Her ears immediately pricked up at these key words. No, she didn’t understand every word, but she did intuit the meaning of them from my tone, inflection, volume, and repetition of key phrases. Her vocabulary of more than sixty words included good, bad, no, eat, hungry, go out, go ahead (meaning to do her business), stay, sit, come, down, and beat it. If I asked:”What are you doing?” her head anxiously cocked right up, as she stopped the offense. She also was well-acquainted with cookie, spaghetti, toast, corn, cracker, treat, cake, coat, ball, keys, sock, and bone, to mention just a few of her favorite things to munch or chew on. And when she heard the phrase “get in your house,” she always hightailed it back into her crate, happy to recline on her blue blanket while keeping a watchful eye on the action. With a large arsenal of words at her command, and her ability to comprehend my meaning, Katie was fully communicative and bossy too, quite definite about what she wanted and when. For example, when I was trapped in bed during a two-week period with a back injury, she’d retrieve a sock and jump up onto the bed and throw it at me, ready for tug of war. “You hit me in the face with it!” I objected. She just stared at me obstinately, determined to play. You either complied or she would rip the sock to shreds on her own. One day, she grabbed the TV’s remote control and started playfully pushing her paw down on the buttons, watching the screen as the channels changed. It wasn’t long before she understood the connection between her action and the picture and she often grabbed the remote away from me, turning it into a game, pushing down on it to change channels until she found one she liked, usually cartoons. The red chair she’s sitting in above was her favorite TV-watching perch. One day she observed me typing at my desk, and later on, she jumped up onto the desk chair, planted her paws on the keyboard, and mimicked me, “typing” away as she watched the characters on the monitor change. 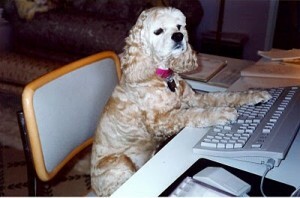 This she began to do all the time–and we called her the typing dog. In wintertime, after she came in from a walk, she liked having her paws washed off with warm paper toweling, something I’d done since she was a puppy to get rid of the street salt. She’d either trot into the bathroom and sit there, waiting, or grab a roll of toweling from the bathroom with her mouth and bring it to me, dropping it for me on the bed. Talk about smart. What can your dog do? Write me an E-Mail at [email protected] and tell me, and we’ll include it on the Community page of my upcoming new web site, Katiebook.com. 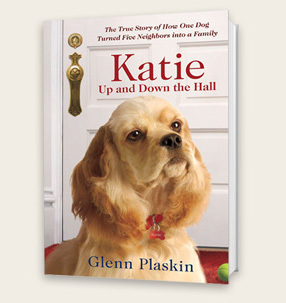 But for now, please visit my main web site, glennplaskin.com, AND watch the Katie Book Trailer, which makes its debut on YouTube today. 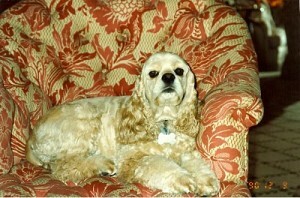 Please send the link to your friends and family and all the dog lovers you know. It’s a really emotional, touching video that captures the essence of Katie’s personality and of our story. And in the video, you’ll see what fashionable dogs are wearing this season–and much more. 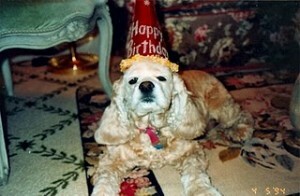 Hope some of the pictures of Katie gave you a laugh. After all, it’s April Fool’s Day. But: I didn’t fool you with any of this, for everything I’ve told you about Katie is quite true. And much more of it’s in the book.